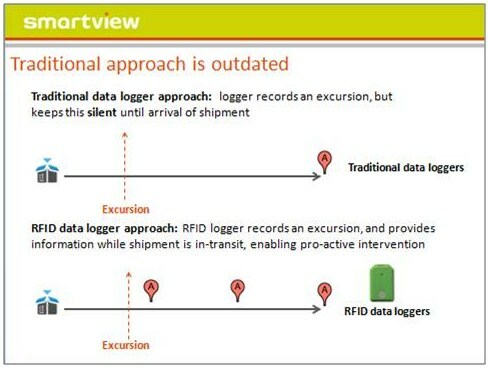 SmartView, an award winning solution for cool chain optimization from Intelleflex partner Antaris Solutions, is utilizing RFID solutions such as Intelleflex temperature monitoring tags and readers to enable logistics provider Panalpina to better control and manage shipments of temperature sensitive goods such as pharmaceuticals. A story, which appeared recently in Logistics Week and a number of other publications details how SmartView delivers new levels of visibility and control by providing Panalpina with actionable data about the status of their shipments as they move from the manufacturer in Europe to the United States via Panalpina’s 747 air freighters. Panalpina, with operations on six continents, uses SmartView in its own controlled air freight network. SmartView provides Panalpina an integrated control center to manage temperature sensitive shipments throughout the end-to-end supply chain. Temperatures can be documented in the air, and actively monitored in the transit warehouse and on the road. Where there are instances of temperature deviations, Panalpina now has the tools to proactively intervene. Traditional data loggers only provide information about the condition of a shipment after it has been delivered when it is too late to take any corrective action. Monitoring the products in transit using Antaris’ SmartView as they move from manufacturer to the customer enables Panalpina to provide a better level of service to their customers creating a competitive advantage for them in the marketplace. This process can all be automated so that Panalpina can collect data even where they have no personnel. With the massive increase in the volume and value of temperature sensitive pharmaceuticals, the old approach to monitoring temperature sensitive shipments is inadequate for managing today’s cool chain. Solutions like SmartView utilize the latest in RFID to address the challenges faced by today’s pharmaceutical manufacturers and third party logistics providers. You can learn more about SmartView by viewing this recent IQPC webinar in which Antaris Solutions Managing Director explains how SmartView is helping Panalpina deliver a superior service to its customers. This entry was posted in Actionable Data, Pharmaceuticals, RFID News, RFID Tags and tagged Antaris, Antaris Solutions, Panalpina, SmartView. Bookmark the permalink.